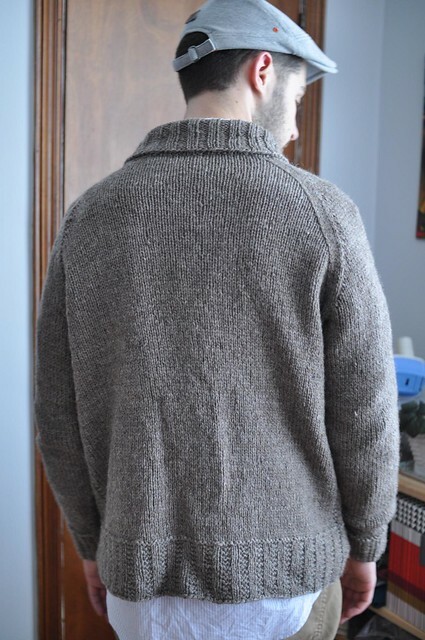 I finished Dale’s cardigan in time for Christmas! He loves it and has worn it a bunch of times over the last week – it’s been pretty cold and snowy, and the sweater is definitely cozy and warm. I used the Cascade Eco Wool that I ripped from a not-quite-right sweater, but I did run out. Of course, I picked up 2 extra skeins and only needed a bit of one, so I have more of the same colour for something else! Maybe a scarf? Total ended up being a little over 4 skeins for a 45″-ish chest. Pattern is my own, and very plain (despite the sweater surgery I had to perform on it). The body is worked flat from the bottom to the underarm with kangaroo pockets, the sleeves are worked in the round, and then the whole shebang is joined for the raglan yoke. 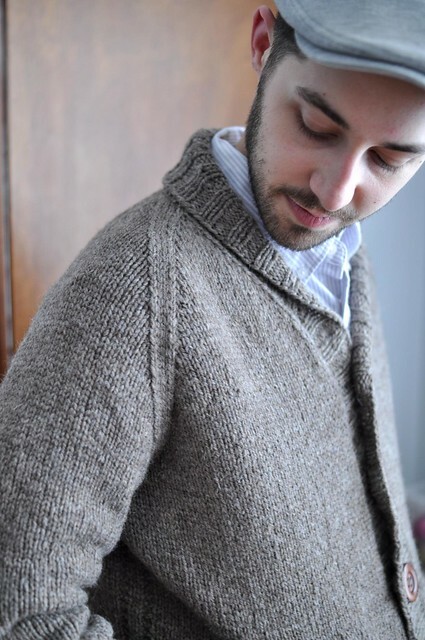 I made the V-neck a little higher than I would on a sweater for myself, and the shawl collar rounds things out nicely. The big wooden buttons are from AnnyMay on Etsy, again. Good stuff. So what are your plans for the new year? I’m not really one for New Year’s resolutions, but I do need to think about what I want to accomplish this year and how to get there. I suppose my main goal is to work harder than ever before, while maintaining my sanity! I have a bunch of projects still in progress from last year, and I’d like to get those cleared out for new projects, but I’m already working on some new ideas and directions for this year. I’m hoping to get over my fear of rejection and submit more ideas to magazines, in addition to lots more self-published designs. I’d also like to do more tech editing this year. If you’re looking for an editor, drop me a line! Stay warm if it’s cold where you are. Happy New Year! Well. I love your designs, so I say you just keep submitting! This turned out great! It fits him perfectly. Great sweater Laura! I am sure that he will get a ton of use out of it. Especially with this crazy cold! 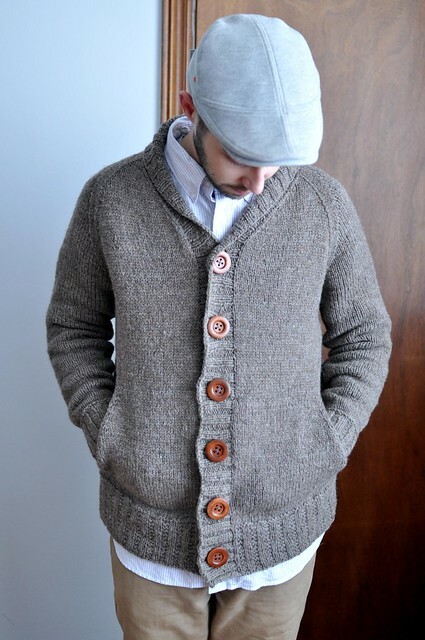 I love this sweater, and I would like to make it for my husband. Is this one of your patterns? 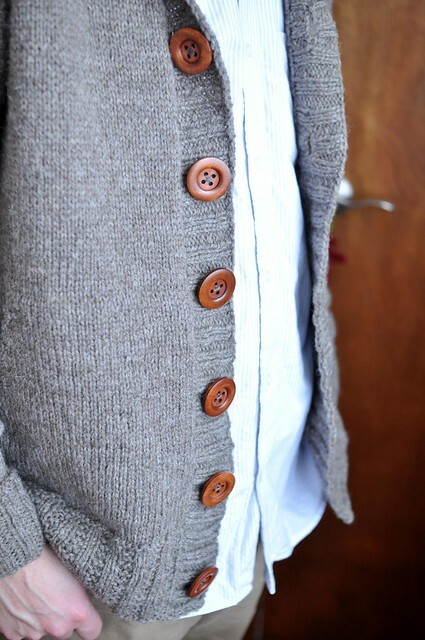 What is the name of the cardigan?